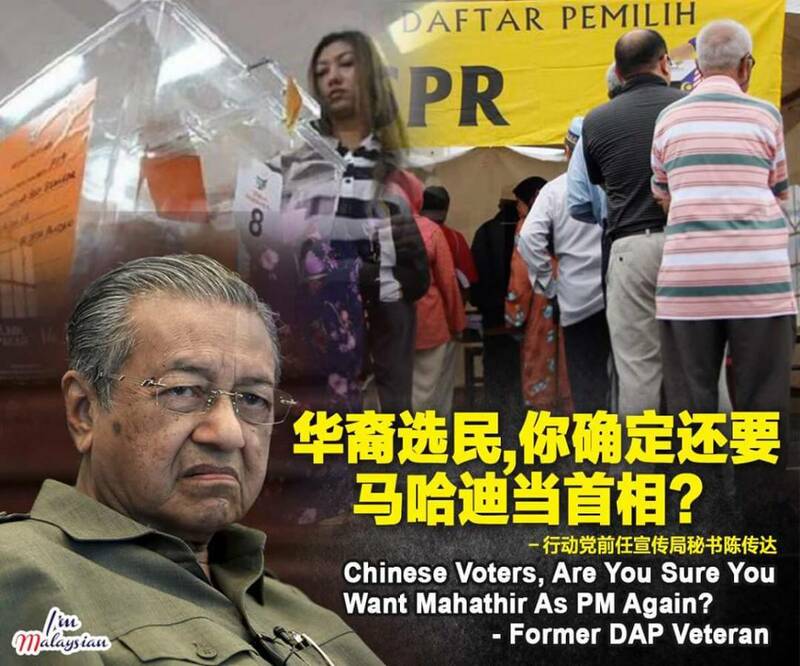 Chinese Voters, Are You Sure Want Mahathir Back As PM Again? “If Najib, the present PM is elected out, do you all think Mahathir, who has caused our country to be what it is today, can replace Najib or it is just out of fun and anger to replace him? The 2013 ‘Chinese Tsunami’ was the biggest contributor to the high voter support for Pakatan Rakyat (now known as Pakatan Harapan) during the 13th General Election (GE13) with the hopes that it can topple the Barisan Nasional (BN) government. While Chinese sentiment towards Datuk Seri Najib Tun Razak since 2013 is hard to gauge accurately, the nomination Pakatan Harapan’s candidate, Tun Dr Mahathir, might yet galvanise many to decide to stick with the opposition. But former DAP Publicity Secretary Tan Tuan Tat cautioned Chinese voters to ask themselves if Mahathir really is the best option for Chinese voters. “We Chinese have to be wise, and not be blinded and vote emotionally,” said Tuan Tat in a statement to Malaysian Digest. Chinese voters’ anger towards Najib’s government is based on rumours that “Najib is the most corrupted PM in history”, but they cannot prove that Najib is as corrupt as what the rumours say. But what Chinese voters do not realise is that their ‘handiwork’ is directly responsible for the erosion of Chinese representation in Parliament, caused by the reduced number of Chinese MPs from the ruling parties representing the Chinese community who won elected seats in GE13. And what is more saddening, said Tuan Tat, is that there are Chinese voters who do not care that they are wiping out Chinese representation in our government as long as PM Najib Razak is toppled to ‘save Malaysia’. “The right to speak up for the rights of the Chinese in Parliament has reduced significantly as a result of having smaller number of MPs from BN to represent them. Resources are being distributed to those who are in need but certainly it is not in favour of the Chinese. The GE13 tsunami by the Chinese is being perceived as the Chinese being against the government regardless of the deeds that have been given. “Chinese school is a privilege not a right. The Indians know this simple rule and they are now supporting BN, thus the government is giving additional funds to support their Indian school. Who is to blame? Either you support the government for a better future or you will be left out. Touching on Najib’s corruption allegations, Tuan Tat stressed that foreign investors did not pour funds into Malaysia to build various mega projects if the allegations against the PM is true. “An important point that every Chinese voter needs to ponder on is that we as Chinese want a strong economy. It’s time to look at the facts instead of making important decision based on rumours or hearsay. 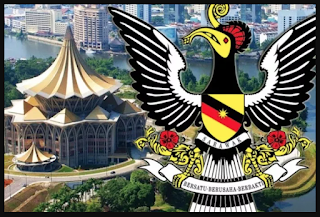 “In terms of Foreign Direct Investment (FDI), Saudi Arabia invested RM31 billion, India signed an MOU involving RM158 billion while China has pumped in RM144 billion to Malaysia. “The premier in China is going all out against corruption so are you all telling me that the premier is also corrupt? Never forget the English saying, birds of the same feather flocks together,” said Tuan Tat. He added that the FDI brought in during Najib’s rule, which is what the Chinese have wanted all this while, shows that the Prime Minister listens and takes note on what the people want for the nation’s economy. He also said that the Bursa Malaysia stock market also recorded positive gains when the Kuala Lumpur Composite Index (KLCI) reached 1800 points on January 4 this year. “Do you know when was the last time we hit 1800? It was around 3 years ago in year 2015. Why did the market go down? It was because of the false allegation on 1MDB created by Mahathir. “Now, we made it again this time because foreign investors know who to trust and not trust. We too must be knowledgeable and not be gullible,” explained Tuan Tat. Tuan Tat also touched on the allegations about the ‘selling off’ of the country that is always mentioned by Mahathir including the Malaysia-China Kuantan Industrial Park (MCKIP) that has become an iconic landmark marking the two-way relations between Malaysia and China. “Actually, there is a piece of land in QinZhou China with the same functionality as MCKIP, named China Malaysia Qinzhou Industrial Park (CMQIP), which is bigger in terms of land size and expected investment than what we have in Kuantan. “So, why is Mahathir not saying that China is selling their country to Malaysia where our Jalur Gemilang flag is flying high and proud in China?”, asked Tuan Tat.